Once upon a time in a land far away, laundry baskets were acceptable pieces of furniture and they had no need to ever be flattened or put away. I think that never happened anywhere! What I have found is an exciting, trending piece that you will need for your laundry room, or you can keep it in your car. This is a multi-functional item that can be used by those in college, traveling or in your daily domestic deeds. Check out the piece I have found for the laundry room that has me living life lavishly out loud while I announce it’s practicality! Meet The Magnetic Catch-All Laundry Basket from Microdry. This basket folds flat, attaches to the dryers to things can just slide from the dryer into the basket. I love it because I can tote it in the car and set it upright when I need it, or pack it with items when we travel and use it if we visit the laundry room or have dirty clothes that need to keep a lid on them! You can find this great product line at Bed, Bath & Beyond. If you are shipping those college back to school, space is at a premium in those small rooms and this is the perfect Laundry Basket to answer the cry for no space. The Magnetic Catch-All Laundry Basket from Microdry has a magnetized lid that attaches to the dryer that acts as a guide(slide) directly from the dryer. You simply swoosh your clothes forward from the front loading dryer and it sits at the base and the clothes slide ride down the lid. The opening is nice and wide so your clothes go right into the laundry basket and nothing hits the floor! This is great for the not-so-clean laundry rooms at school, apartment basement laundry rooms or even just in your own home where it is better to ‘catch’ stuff in a basket so it has a better chance of making it out of the laundry room and into the right room! The lid is magnetized so it attaches under the dryer door. Why I Love This Particular Basket? I love that my clothing can come right out of the dryer, right into the laundry basket, via the lid that is attached to the dryer. The clothes literally slide right in with me only pushing the clothes out of the dryer! I am sure then that the clothing is out of the dryer, not on the floor and it stands a better chance of getting carried out of the laundry room than those items that hit the floor! (kind of organized!) . I love the Catch-All lid because it ensures that when I transport laundry from room to room, nothing ‘pops’ out of the basket! I also like that I can store lingerie, cami’s or socks on the outside mesh bag, it keeps things sorted!. The fact that the bag folds flat, makes it the perfect solution for storage! The flatness allows me to store this in my car when we are traveling and when I need it, I set it up, and begin using it, but it takes no space. 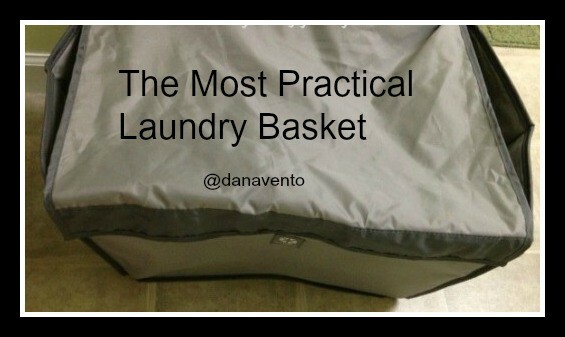 If I have dirty laundry when traveling the basket has a cover to keep the ‘dirty’ smell out of the air and contained. In any small laundry area having a basket that collapses out of the way is such a plus and keeps things neat and tidy. You too can live life lavishly out loud with great find for your laundry room, travels, or college room.